The Spring gardens continue to enthral. The gardens are constantly changing as one batch of plants burst into bloom, reach their peak, then the flowers die and another starts. Here is the latest batch of student weaving hot from the loom. We continue to celebrate their triumphs. 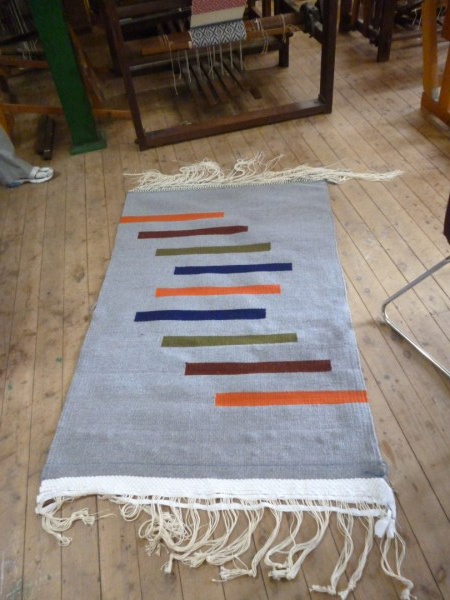 Del’s rug hot off the loom. Everyone is standing back to admire it. Maureen and her huck lace hand towels. They are all different patterns. Tuesday with her series of table mats. 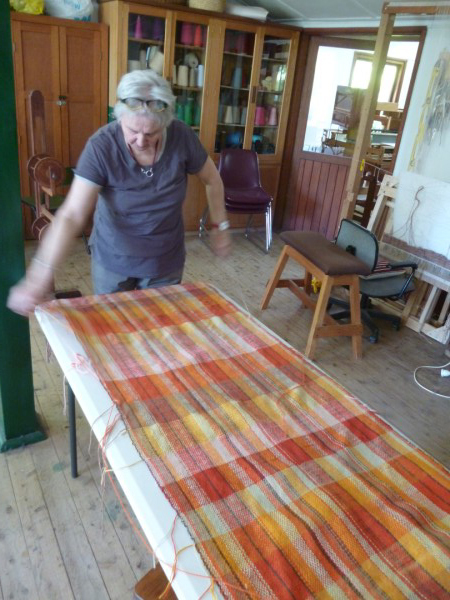 An exciting project is underway in the weaving studio: The Sturt community rug project. 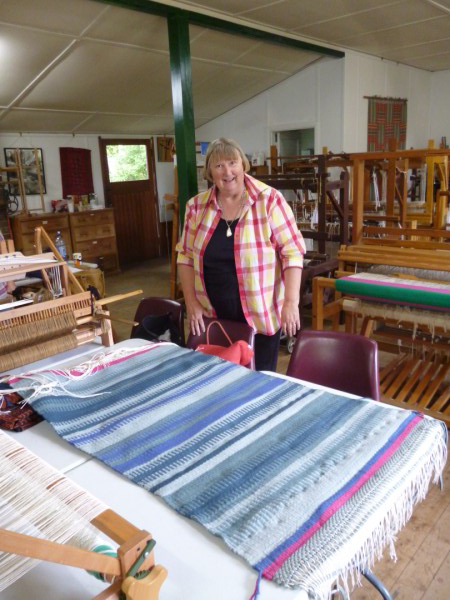 The aim is to weave two rugs 2 x 3 metres for Sturt Cottage. It is also to be a community project where anyone young or old, male or female can come and participate. Joan and Julie from “Friends of Sturt” ball the yarn. It has been great to be able to call on their assistance to do all that preparation. 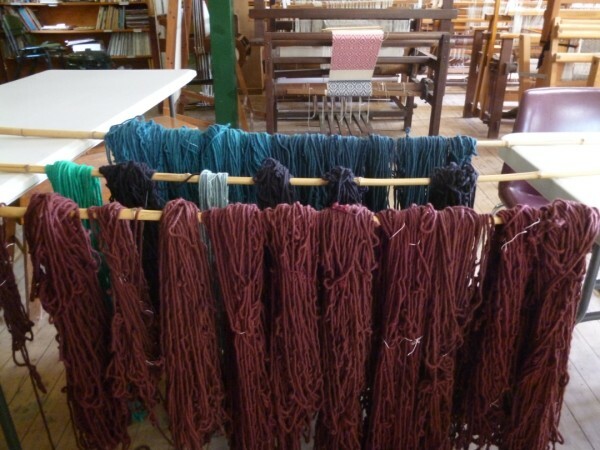 The waste yarn goes in to prepare for the actual weaving. I gave that honour to Joan, the president of Friends of Sturt. 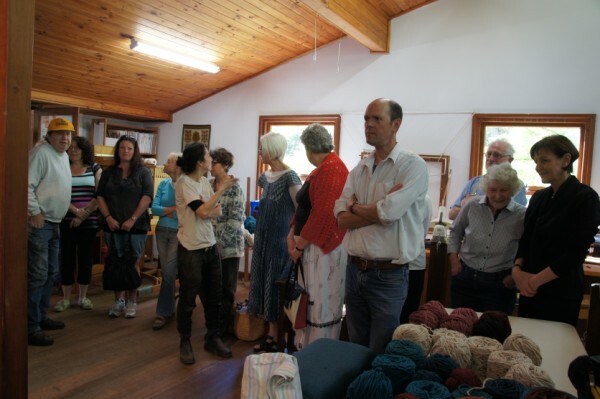 The rug was officially launched with a morning tea. There was great support shown by the Sturt community. I hope everyone will come to weave. Julie Gillick, Head of Frensham and Winifred West Schools throws the shuttle for the first row. Mark Viner, Head of Sturt throws the next. 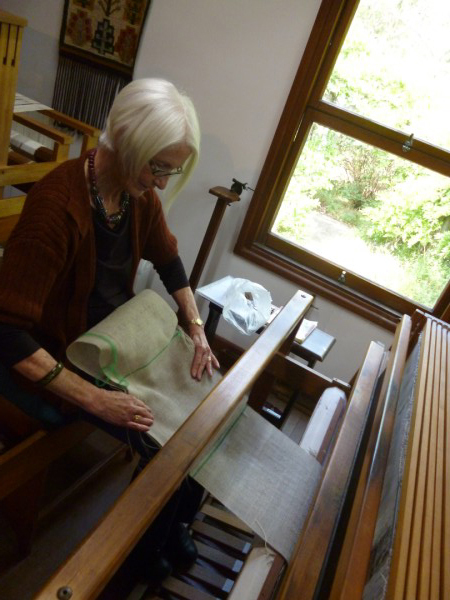 And Elizabeth Nagel who was weaver in residence for 50 years throws the next. 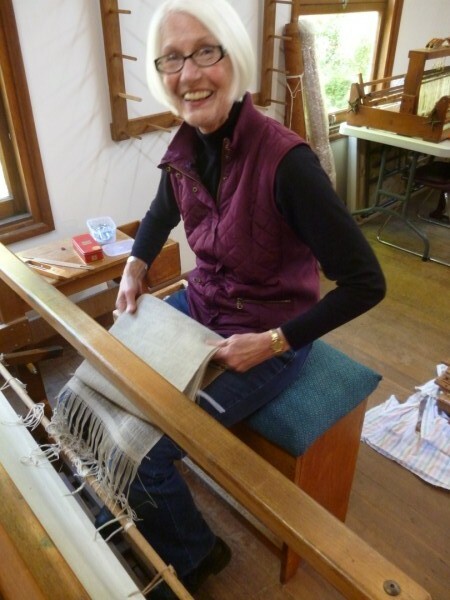 Elizabeth told the story of how her first job when she came to Sturt was to assemble this loom. 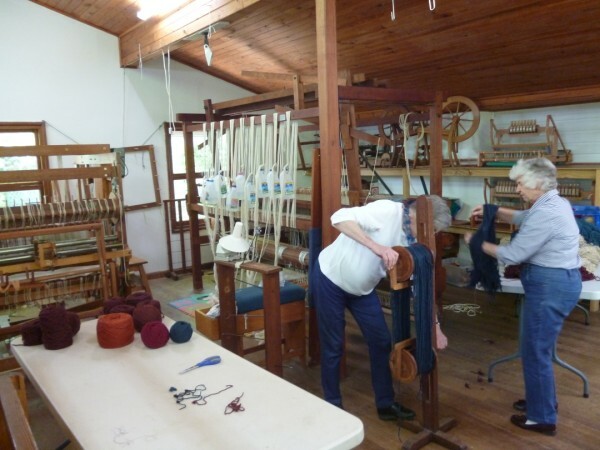 Once the morning tea was over, the first 30 minute block of weaving time was completed by Chris, from pottery. Indra, a non weaver has her turn. Several others have participate. All get to write their name in the “Visitor’s Book”. We reach half way on the first rug and toast our achievement. 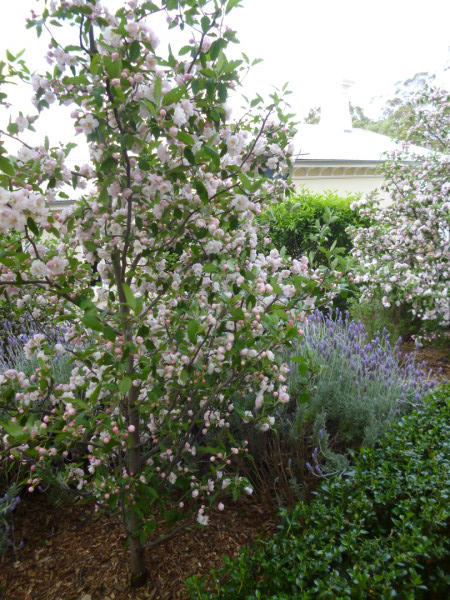 The Spring gardens at Sturt are fabulous. The cycle is constantly changing with new plants starting to flower while others ending. 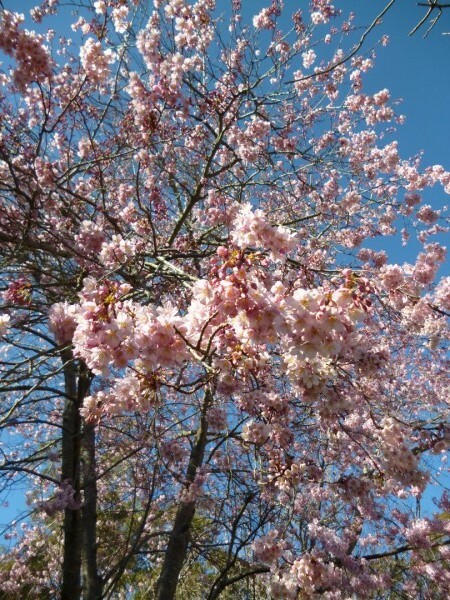 This magnificent flowering cherry took my eye at the start of the month. 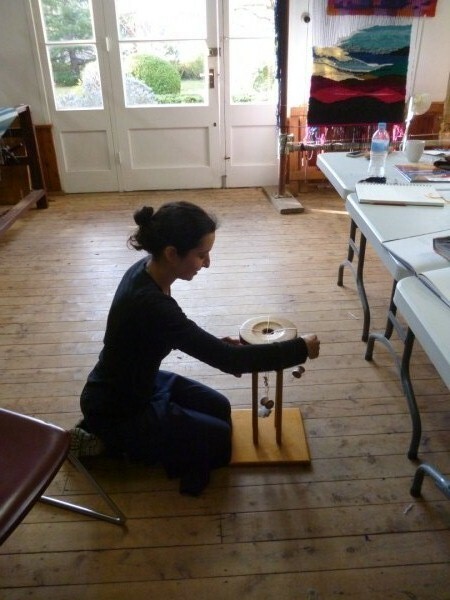 The month began with a beginner half day workshop followed by a 2 day procion dye workshop. 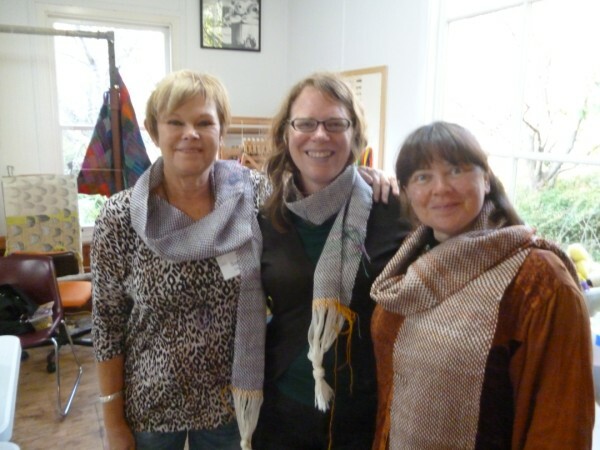 After 3 hours these ladies went home proudly wearing their scarves. 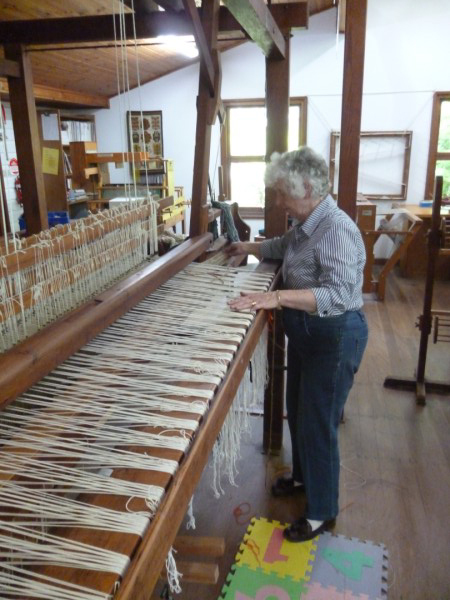 The looms had been pre warped so that they could experience the joy of throwing a shuttle and learning a new skill. They had never woven before. What a great achievement! 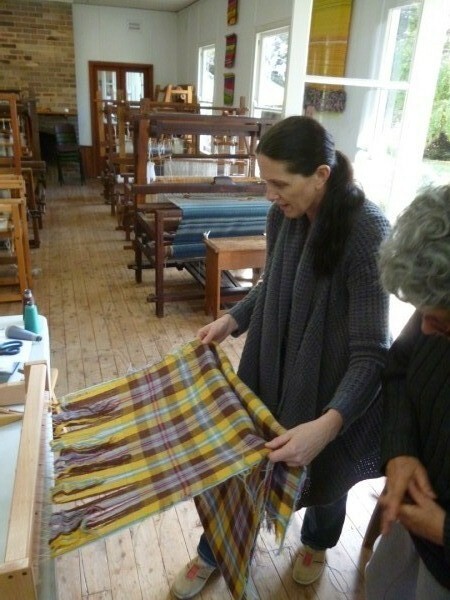 The 2 day dye workshop produced a huge amount of dyed materials: not just on fabric or yarn. 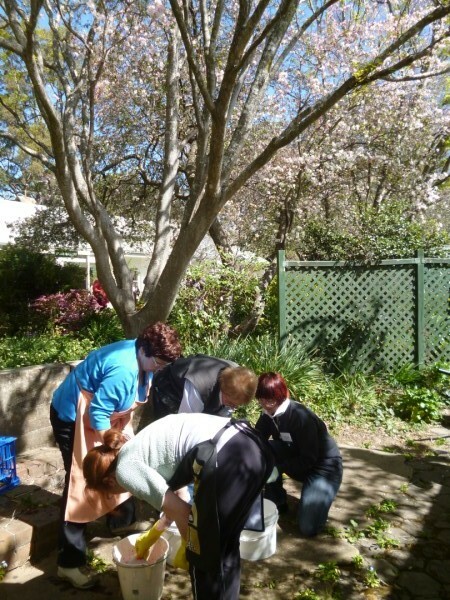 We dyed paper folded shibori fashion outside under the crab apple. 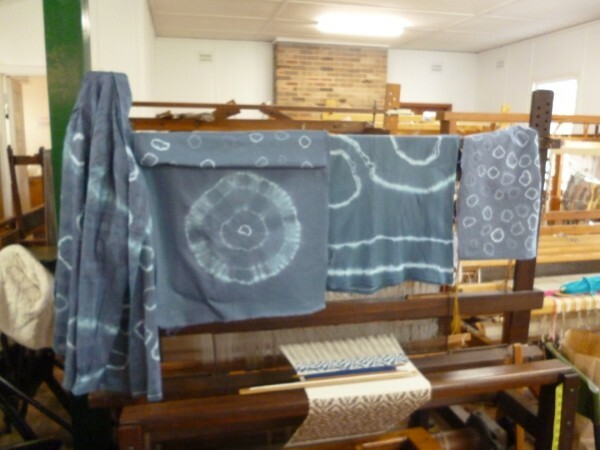 This is just one of the dye projects undertaken. I forgot to take a photo of the total amount produced. Several approaches were explored so all went home with quite a collection. And then there was the flurry of completed weaving. 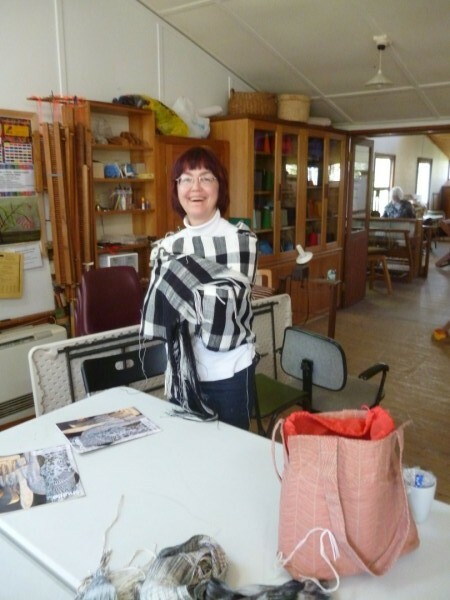 Belinda’s stunning black and white scarf woven on just 4 shafts. Bev couldn’t wait to model her soon to be completed poncho. She throws the end over her shoulder with flair. 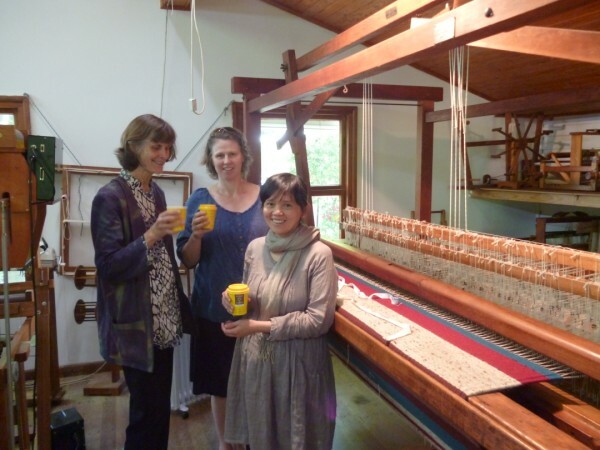 It is woven on 4 shafts with an interesting varigated yarn. Maureen cuts off 6 linen handtowels in 3 end huck. They look good now, but we can’t wait to see them finished off. A very excited Lou examines her tartan. She thinkls it looks good now, but later she saw how really good it looked after finishing. And her eye for detail paid off: the design really was square. 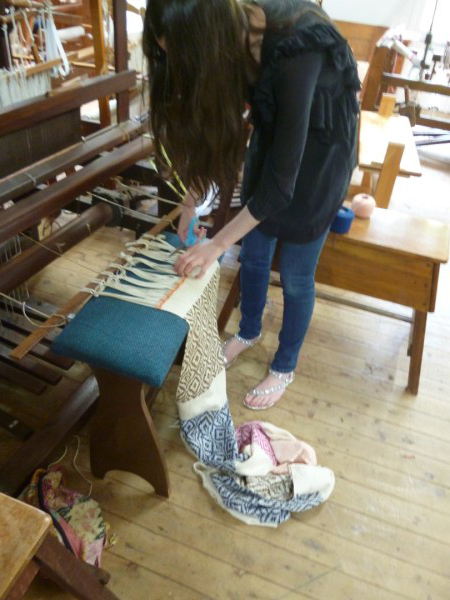 Isobel is a full time wood student at Sturt who sometime spends time in the weave studio. There is a lovely cross over between the studios. She is learning how to do kumihimo which will be incorporated into one of her end of year pieces. I can’t wait to see the final work. 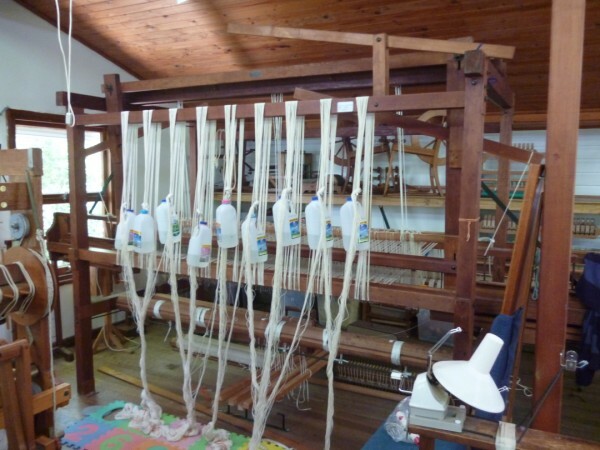 Looms of two eras have arrived in the weave studio. 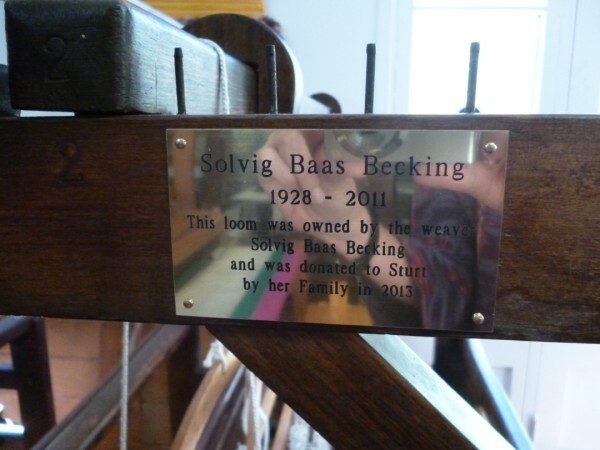 A loom of historical significance has been donated by Solvig Bass Becking’s family. 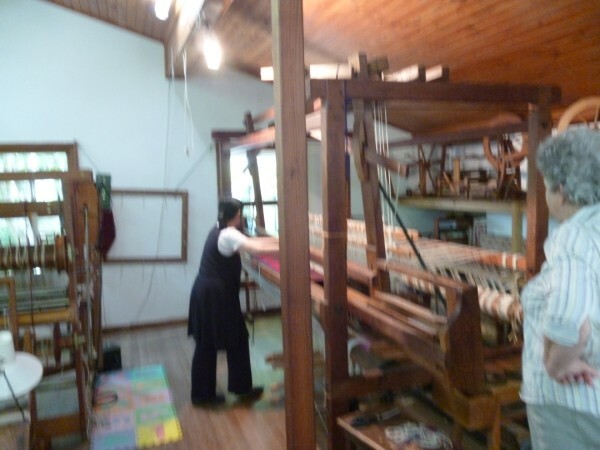 This is a loom of its era and we at Sturt believe was probably made here in Mittagong for weavers such as Solvig, Elizabeth Nagel and Erica Semler. 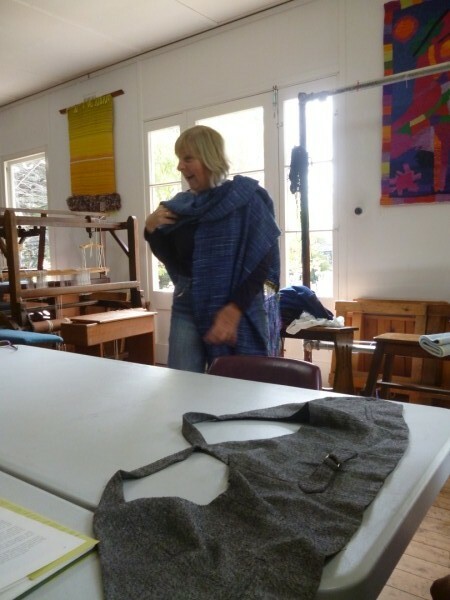 There are 4 others in the weave studio which were probably made originally for Sturt. 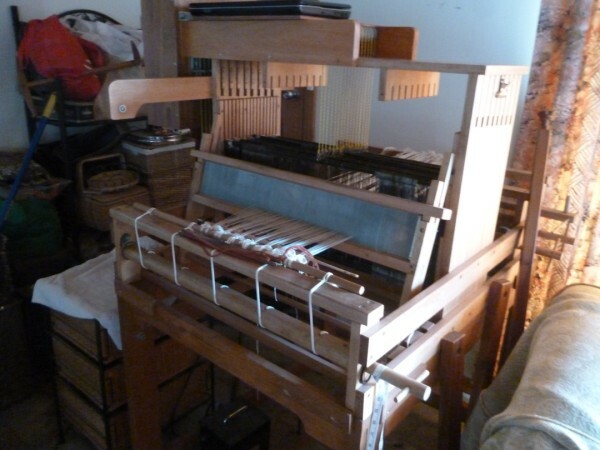 A commemorative brass plate has been attached to the loom. At the other end of the spectrum, I have acquired 2 computer assist looms which my students have access to. 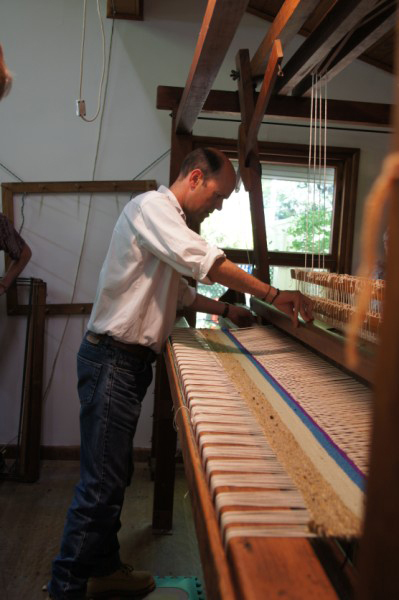 While these looms are of this era, they also have providence. 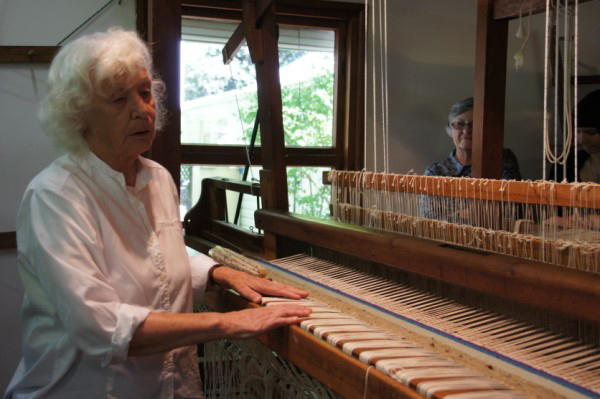 They were originally owned by Truda Newman, also a nationally well known weaver. 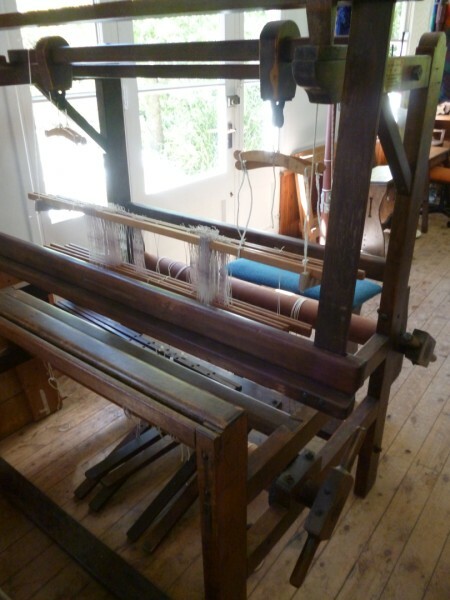 The large Noble loom was made in Adelaide. 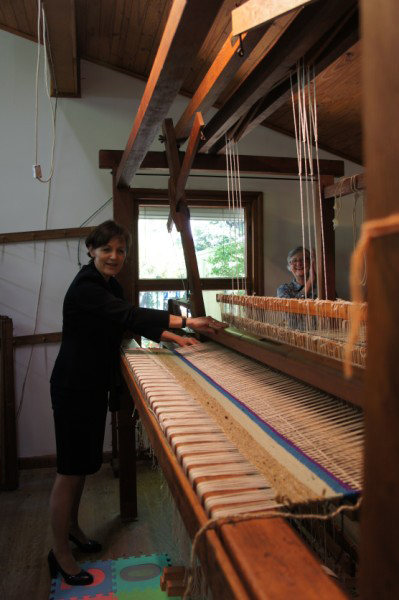 This, the smaller table loom was made by Truda’s husband, an engineer and later converted to a computer assist by Eric Noble. 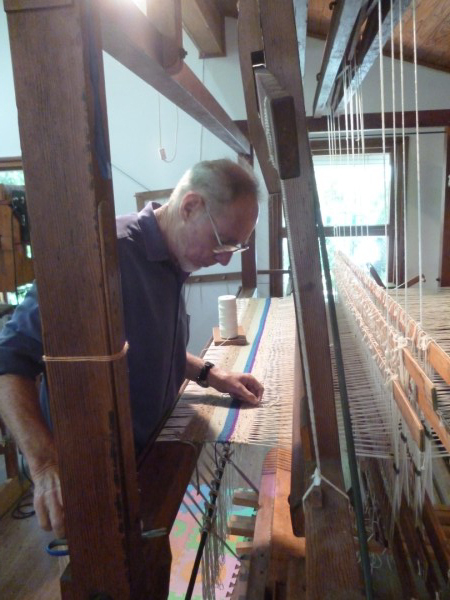 Pat Muir of Wollongong owned the looms from 2010. 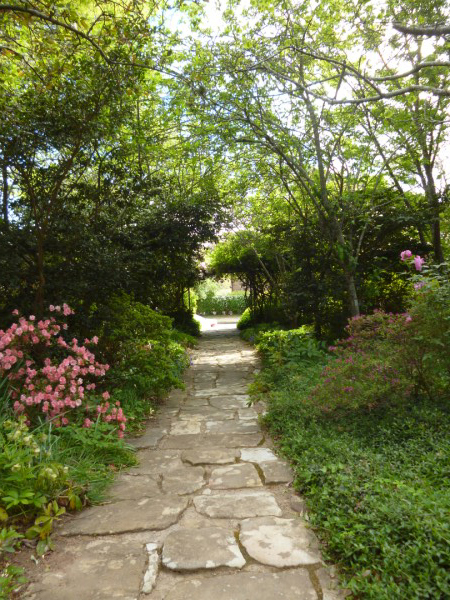 You are currently browsing the Kay Faulkner's Blog blog archives for October, 2013.